Bu çalışma ile Türkiye Milli Biatlon Takımı sporcuların somatotip, vücut kompozisyonu ve motorik özelliklerinin incelenmesi amaçlandı. Çalışmaya, Türkiye Biatlon Milli Takımı Hazırlık Kampı’nda yer alan 10 erkek sporcu ile 7 kadın sporcu gönüllü olarak katıldı. Tüm sporcuların somatotip özellikleri, vücut kompozisyonları, sırt-bacak kuvveti ve sağ-sol el kavrama kuvvetleri ölçüldü. Vücut yağ yüzdesi ve somatotip ölçümlerinde Holtain marka skinfold kaliper kullanıldı. Yağ parametreleri Siri formülüne göre hesaplandı. Somatotip parametreler ise Heath-Carter’a göre hesaplandı. Kavrama kuvveti parametrelerini ölçmek için Holtain marka el dinamometresi, sırt ve bacak kuvveti parametrelerini ölçmek için bacak dinamometresi kullanıldı. Sonuçlar aritmetik ortalama, standart sapma ve %95 güven aralığında değerlendirildi. Sonuç olarak, Türk Milli Biatlon Takımı sporcularının antropometrik ve seçilmiş motorik özelliklerinin uluslararası normların altında olduğu ve madalya kazanmak için yeterli olmadığı görülmektedir. The aim of this study was to evaluate somatotype, body composition characteristics and selected motoric characteristics of biathletes in the Turkish National Team. A total of 10 male biathletes and 7 female biathletes, all members of the Turkish National preparation camp participated in this study voluntarily. The variables measured including somatotype characteristics, body compositions, back-leg strengths and right-left handgrip strengths. Body fat percentage and somatotype were measured by Holtain Skinfold Caliper. Body fat percentage was calculated with the equation provided by Siri formula. Somatotype components was calculated according to the equation recommended by Heath and Carter. Hand grip and back-leg dynamometers were used to evaluate for strength measurements. The results were presented as mean, standard deviation and 95% confidence interval. As a result, the anthropometric and selected motoric features of the Turkish National Biathlon Team athletes are below international norms and not enough to win medals. Referans 1 Alhirdas, C. (2011). Age and body build of high rank skiers/А. Chepulenas, B. Statkyavichune. Theory and Practice of Physical Culture, (12), 3-6. Referans 2 Bergh, U. ve Forsberg, A. (1992). Influence of body mass on cross-country ski racing performance. Medicine and Science in Sports and Exercise, 24, 1033-1039. Referans 3 Carlson, R. (2011). Talent detection and competitive progress in biathlon – a national example. Polish Journal of Sport and Tourism, 18 (4), 290-295, [Available online at: https://www.degruyter.com/downloadpdf/j/pjst.2011.18.issue-4/v10197-011-0023-5/v10197-011-0023-5.pdf], Erişim tarihi: 2 Eylül 2017. Referans 4 Cicioğlu, İ., Günay, M., Gökdemir, K. (1998). Farklı Branşlardaki Elit Bayan Sporcuların Fiziksel ve Fizyolojik Profillerinin Karşılaştırılması. Gazi Beden Eğitimi ve Spor Bilimleri Dergisi. 3-4: 9-16. Referans 5 Claessens, A. L., Veer, F. M., Stijnen, V., Lefevre, J., Maes, H., Steens, G., ve Beunen, G. (1991). Anthropometric characteristics of outstanding male and female gymnasts. Journal of Sports Sciences, 9(1), 53-74, [Available online at: http://www.tandfonline.com/doi/abs/10.1080/02640419108729855], Erişim tarihi: 13 Ağustos 2017. Referans 6 Czuba, M., Maszczyk, A., Gerasimuk, D., Roczniok, R., Fidos-Czuba, O., Zając, A. Ve ark. (2014). The effects of hypobaric hypoxia on erythropoiesis, maximal oxygen uptake and energy cost of exercise under normoxia in elite biathletes. Journal of Sports Science & Medicine, 13(4): 912-920. Referans 7 Hoffman, M. D., Gilson, P. M., Westenburg, T. M., & Spencer, W. A. (1992). Biathlon shooting performance after exercise of different intensities. International Journal of Sports Medicine, 13(3), 270–273. Referans 8 Kočergina, N., ve Čepulėnas, A. (2012). Indıces Of Elıte Female Bıathletes’age And Body Composıtıon. Lase Journal Of Sport Scıence.3(2): 69-79. Referans 9 Larson, P. & Henriksson-Larsén, K. (2008). Body composition and performance in cross-country skiing. International Journal of Sports Medicine, 29(12), 971–975, [Available online at: http://europepmc.org/abstract/med/18600606], Erişim tarihi: 15 Ağustos 2017. Referans 11 Mikkola, J., Rusko, H., Nummela, A., Paavolainen, L., ve Hakkinen, K. (2007). Concurrent Endurance and Explosive Type Strength Training Increases Activation and Fast Force Production of Leg Extensor Muscles in Endurance Athletes. Journal of Strenght and Conditioning Research, 21 (2), 613-620. Referans 12 Psotta, R., Sviráková, D., Bunc, V., Šeflová, I., Hrásky, P. & Martin, J. (2009). Aerobic fitness, running performance and body composition of Czech elite male summer biathletes. Fitness Society of India, 5(1), 41-49. Referans 13 Randáková, R. (2005). Effect Of Regular Traınıng On Body Composıtıon And Physıcal Performance In Young Cross-Country Skıers: As Compared Wıth Normal Controls. Acta Universitatis Palackianae Olomucensis. Gymnica, 35 (1): 17-25. Referans 14 Rundell, K. W., ve Bacharach, D. W. (1995). Physiological characteristics and performance of top US biathletes. Medicine and science in sports and exercise, 27(9), 1302-1310. Referans 15 Sinning, W. E., Cunningham, L. N., Racaniello, A. P., ve Sholes, J. L. (1977). Body composition and somatotype of male and female Nordic skiers. Research Quarterly. American Alliance for Health, Physical Education and Recreation, 48(4), 741-749. Referans 16 Stöggl, T., Enqvist, J., Müller, E., ve Holmberg, H. C. (2010). Relationships between body composition, body dimensions, and peak speed in cross-country sprint skiing. Journal of Sports Sciences, 28(2): 161-169. Referans 17 Vickers, J. N., ve Williams, A. M. (2007). Performing under pressure the effects of physiological arousal, cognitive anxiety and gaze control in biathlon. Journal of Motor Behavior, 39 (5), 381-394. Referans 18 Vonheim, A. (2012). The effect of skiing intensity on shooting performance in biathlon (Master's thesis, Norges teknisk-naturvitenskapelige universitet, Fakultet for samfunnsvitenskap og teknologiledelse, Institutt for bevegelsesvitenskap. ISNAD ATEŞ, BAHAR . "Türk Milli Biatlon Takımı Sporcularının Somatotip, Vücut Kompozisyonu ve Motorik Özelliklerinin İncelenmesi". 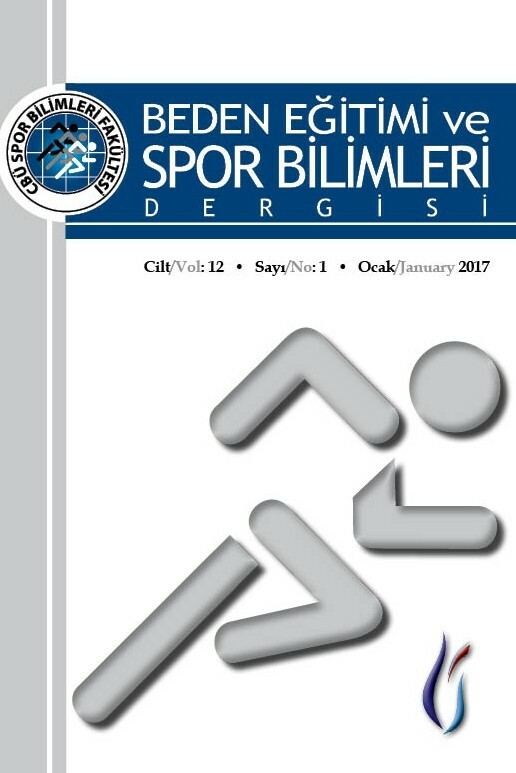 CBÜ Beden Eğitimi ve Spor Bilimleri Dergisi 12 / 2 (December 2017): 108-116.